Yesterday I shared the recipes for the main course from my pumpkins and polka dots party, but let’s get onto the good stuff. Today..it’s dessert! 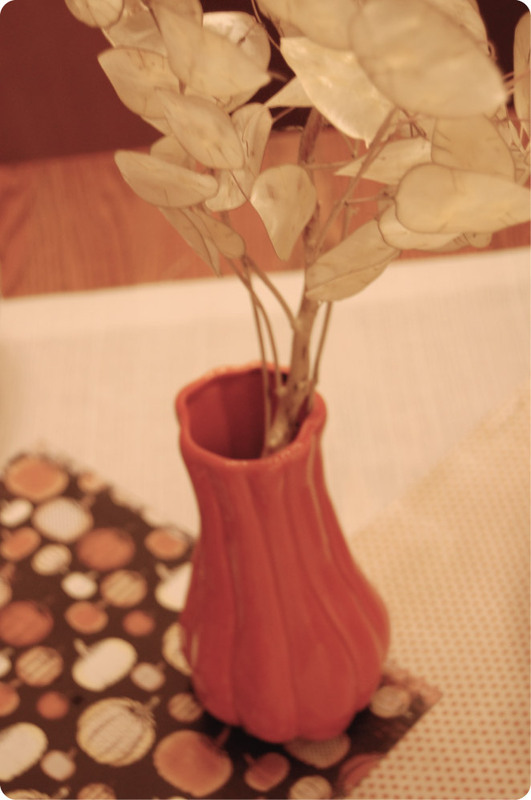 The pumpkin centerpiece is a harvest vase from Crate and Barrel filled with silver dollars. I swooned over these at Sendik’s and had to ask what exactly they were called. They are very delicate and the best part is, they don’t die. What says fall more than a caramel apple? With a twist on the original, I created these cupcakes, complete with a caramel apple stick, to resemble a taffy apple in both look and taste. 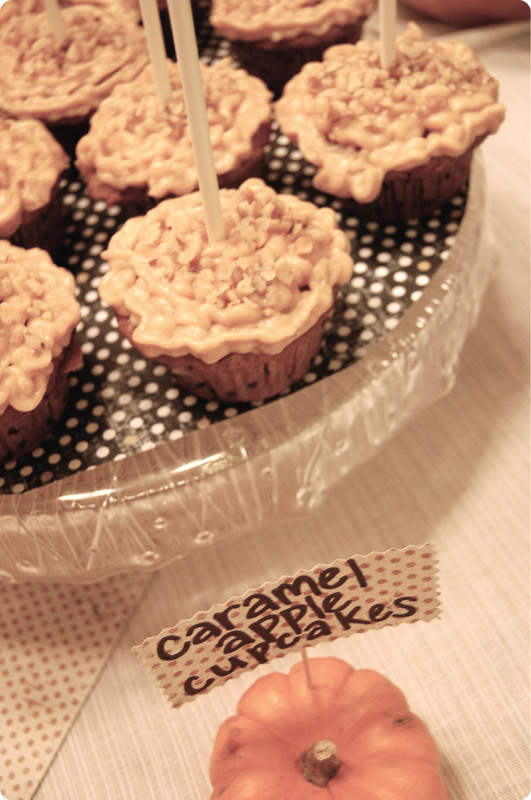 The cupcake is apple spice with a sea salt caramel frosting, topped with crushed peanuts. Preheat oven to 350 degrees. Line standard muffin tin with paper liners. Whisk flour, baking soda, salt, cinnamon and nutmeg. Cream butter, sugar and brown sugar using an electric mixer on medium-high. Add eggs one at a time. Reduce speed to low. Add applesauce and flour mixture, beating until combined. Fill cups with batter – almost to the top. Bake for 20 minutes, rotating pan halfway through. Transfer cupcakes to wire rack to cool before frosting. Yields 12-18 cupcakes. Briefly stir together granulated sugar and water in a small saucepan and bring to a boil over medium-high heat. Continue cooking, without stirring, until mixture turns dark amber in color, about 8 minutes. Remove from heat and slowly add in cream and vanilla, stirring with a wooden spoon until completely smooth. Set aside until cool to the touch, about 15 minutes. Combine butter and salt and beat with electric mixer until fluffy. Reduce speed to low, add powdered sugar, and mix. Turn off mixer and add caramel. Beat frosting on medium-high speed until airy and thoroughly mixed, about 2 minutes. Refrigerate until stiff before using, about 30 minutes. I doubled this recipe for these cupcakes because I like a lot of frosting. One and a half would probably work too or just one if you like more cupcake than frosting. 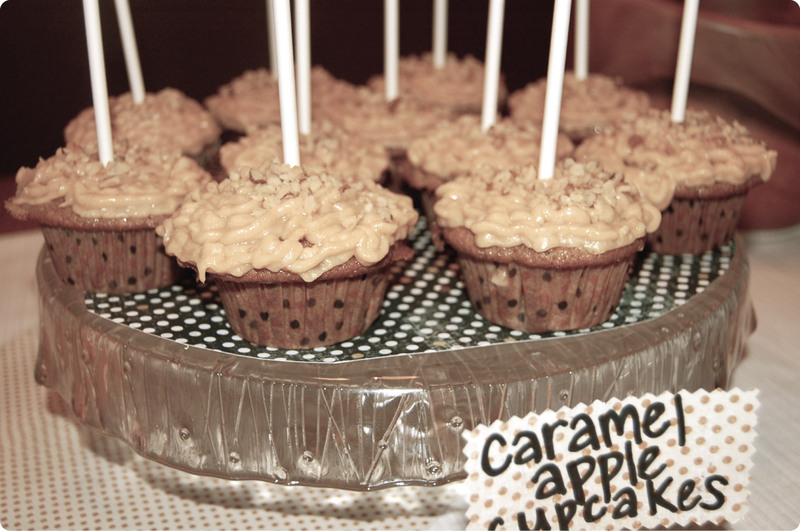 I frosted the cupcakes using a frosting gun, topped with crushed peanuts and stuck a candy stick in the middle to resemble a caramel apple. 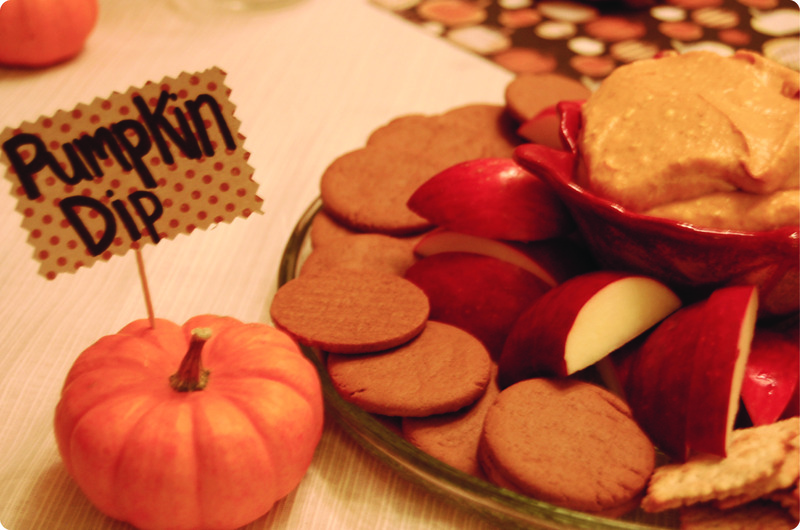 And last but certainly not least, an old fall favorite, pumpkin dip. This can be treated as an appetizer or dessert, or both! I served it with gingersnaps, crackers and apples. Beat cream cheese, sugar and pumpkin in a bowl on medium-high until well blended. Add following ingredients and mix throughly. Chill until ready to serve. Wishing everyone a festive fall! Both the cupcakes and the pumpkin dip look uh-mazing! I’m hosting a dinner party in two weeks and cannot wait to serve this dip!